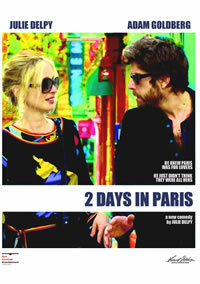 2 Days in Paris had its world premiere at the 2007 Berlin International Film Festival. Director Julie Delpy co-stars with Adam Goldberg (Keeping Up With The Steins, Zodiac). Delpy and Goldberg play thirty-five-year-olds who have been in a relationship for two years. Marion (Delpy) is a photographer, and Jack (Goldberg) is an interior designer. As the film begins, they are arriving in Paris, stopping on their way home to New York for a brief visit with Marion�s family after a largely unpleasant European vacation. Both are hoping for a nice romantic stopover. But nothing goes as planned as Marion struggles between her acquired American ways and being reminded of her French roots by her family and friends. Plenty of cross-cultural hijinks ensue as the hapless couple try to find common ground � and ultimately, their sanity � in the City of Love.